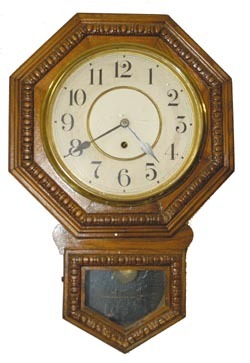 Waterbury Clock Co. hanging, "Arion 10 Inch", C. 1906. Red oak case is 22.5" high, original finish, but more stain applied several years ago to darken. On the inside it appears the case may have been a very light oak in the beginning. Has not been refinished as the wood has old crazing on it. There is a large ripple molding around the octagon top and the base. Full black label inside, part of a label on the back. The catch that holds the bezel to the dial ring, is missing. Doesn't look like a big deal to me. The glass could be a replacement, not sure. PaPa decided to brighten up the brass ring and bezel when he put on the new paper dial, so he painted the brass. As his eyesight is failing some paint got on the glass and other places, but that is fine, it is still a pretty nice old clock Ly-Waterbury #693.